The harbour of Gdansk is rapidly growing and is giving a boost to international shipping. Photo: Wikimedia Commons. Connecting the Baltic Sea with the Black sea will be a major achievement for international shipping. In order to improve European water connections Poland is investing in the navigability of many Polish rivers. This summer the Port of Gdansk and the Polish government started with a feasibility study for the development of the Vistula river, a first step in connecting Gdansk to Brest in Belarus. The fast growing harbour of Gdansk has the only deepwater container terminal in the Baltic Sea able to serve the biggest container ships in the world. It puts Poland in the unique position of being the farthest gate for freight carriers serving the Central-Eastern European markets. To be able to expand transit activities the wet infrastructure needs to be developed. 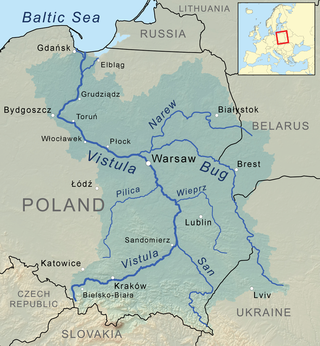 The Vistula flows from Gdansk to Warsaw and crosses the Bug river that leads to Brest. (Source: Wikipedia). According to Marek Grobarczyk, the Polish minister of Maritime Economy and Inland Navigation much remains to be done in order to prepare all Polish rivers in Europe for navigation. Some of the rivers have never been dredged. According to Grobarczyk the process of ensuring the navigability of Polish rivers is taking place after careful consideration of all environmental restrictions and after considering the risks to the environment that it involves. President Andrzej Duda signed in December 2017 a Memorandum to regulate the Oder river entirely and the Vistula river from Warsaw to Gdańsk. The government aims to increase the share of freight from the current 0.5 per cent to 10 per cent. According to the European Agreements Poland is obliged to bring up all navigable inland waterways to international shipping standards. The feasibility study for the comprehensive development of the international waterways will consist of three stages, including the preparation of the necessary analyses and a survey of the current state, including the analysis of the location, primary stakeholders, legal environment, the area and source of funding, a survey of the condition of existing infrastructure, and the analysis of the needs and problems related to the implementation of the programme. The planned execution period of the agreement is 18 months.